Police investigating the slashing of four "historically important" paintings have arrested a man. 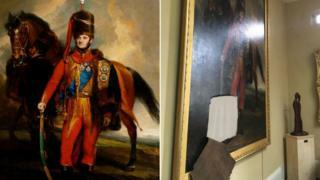 Eye Town Hall in Suffolk was broken into over Easter weekend last year, when vandals cut four oil paintings. The 19th Century pictures included a former mayor, and General Sir Edward Kerrison, who served as the local MP and funded the building of the hall. A man, 47, was arrested on suspicion of burglary in Cumbria on 7 March and released under investigation. The damage, which included a fire extinguisher being set off and internal doors being forced open, happened between midnight on Friday, 30 March and 09:30 GMT on Monday, 2 April. A local fine art expert is working on repairing the paintings but Eye town councillor Peter Gould said the restoration was "a massive job". "Two of the pictures are in the process of being repaired and the others will follow on," he said. "But that is going to take some time. It's extremely expensive to have done." He said the paintings had not only been slashed and torn, but the fire extinguisher spray had "eaten in" to the surface of the paint, required painstaking restoration. He said the repairs would cost at least £25,000, and though most had been covered by insurance, the town council had also had to contribute. At the time of the break-in, the town council had been carrying out a £170,000 renovation which included work on the roof, new lighting and accessible toilets.